When REUTS sent me an ARC copy of this book, I wasn't really sure what to expect. I'll be honest: I wasn't expecting this.When I first started reading THE KEEPERS, I was immediately drawn into the rich details of the story. A few hours later, when I finally resurfaced, I was disappointed that it ended. Not only did Anoosha create a world that I felt like I was a part of, but she also was able to fill this world with characters that felt real.Of course, it was her writing that drew me in first. While so many tout prologues as bad, this is the second book this fall that I felt had an amazing prologue and immediately drew me into the story. As I kept turning pages, twists and turns kept coming. The changes in point of view helped keep me interested, adding depth to an already complex story. I forgot that this was classified as "young adult", the way Libba Bray's A GREAT AND TERRIBLE BEAUTY trilogy does. I really enjoyed the original take on good versus evil. The use of Zarcane, the garden where Adam and Eve were born and the mythology (for lack of a better word) that this story was built around was very well done. The religious elements were expected given the setting of the book, but also very well done. I had lingering questions about the characters, both their histories and their futures, that I'm hoping might be answered in a sequel. Everything about this book's premise intrigued me. Set in Islamabad, with a Pakistani girl taking on threats from a world from Biblical mythology. The blurb hints only vague if at all of potential romance. The two Keepers (spoilers? ), a boy and a girl, end up as best friends, and in a genre inundated with romance, I absolutely love that. Otherwise, There were a lot of characters and plot elements that did a great job of adding interest throughout the book too, like the Snatchers, and Calliel, whose name I knew was a hint to later events. (It's the -(i)el ending.) The story itself was good, but the writing knocks the book down a few stars. There were so many "the"s and so many metaphors, some that work better than others, that they kept knocking me out of the story and I could never get immersed. I also enjoyed the multiple PoVs, but I still had difficulty getting a sense of Farid as a character. And after the end of the book, I really wish that we had gotten to learn more about Rhiya.Also, despite how much of the book takes place in Islamabad, the setting had only a minimal role in the story, and I wish we could have seen or felt more of the city. This book focuses heavily on the plot and the characters' actions, rather than the setting and other details. Anoosha Lalani - Anoosha has always had an insatiable desire to escape reality. It was a childhood trait that never seemed to fade out. If Anoosha were to make one wish, it would be to have wings to journey off the face of this planet and into the worlds of her stories. When she’s not writing, you may find Anoosha working at an accounting firm in Toronto. Having lived in Thailand, Indonesia, Singapore and Poland, she has had the wonderful opportunity to be exposed to a vibrant range of cultures, which have often seemed to find their way into her stories. 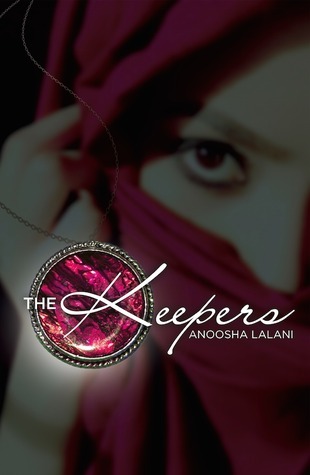 Anoosha was born in Pakistan, the setting of her most recent novel, The Keepers.